Code Wash laundry balls are a green cleaning product, just put them in with your laundry, leave out the washing powder and your clothes come out clean. As well as being environmentally friendly, they are great for those of us with sensitive skin or allergies. Anti bacterial as well as dirt removing. We also include the Multi Stain remover which is as tough on diesel and engine oil and ink as it is kind to the environment. 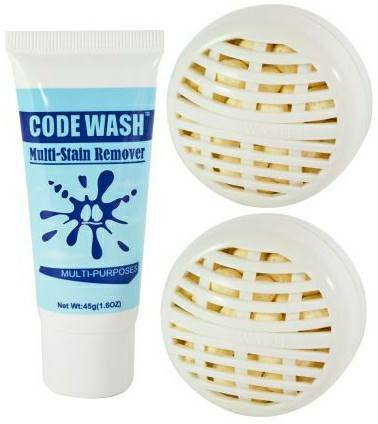 Use your Code Wash laundry balls in your washing machine, and your Code Wash Multi Stain remover on difficult cleaning stains, and even stains on your flooring, porcelain, woodwork and plastic items. Code Wash Laundry Balls text, images and video are copyright.